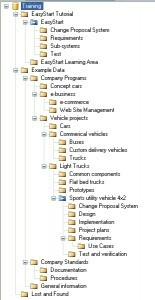 IBM Rational DOORS is a requirements management application, allowing the user to capture, track and manage requirements. 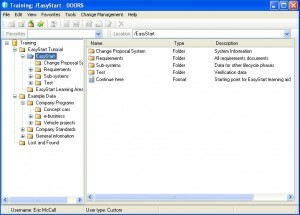 SODIUS provides MDAccess for DOORS as a way to get access to all of this information using a simple Java API and Eclipse EMF representation. This article is a presentation on how to use this technology. For more details on how to use MDWorkbench, refer to the Introduction to MDAccess for Excel article. 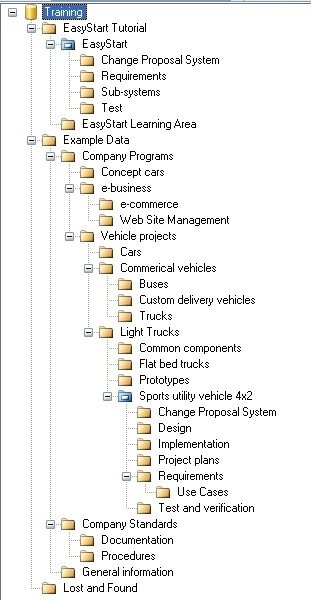 The root element in the DOORS metamodel is Folder. 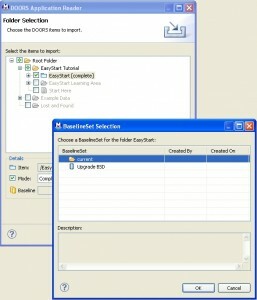 In a DOORS session, the root Folder is called "Root Folder". 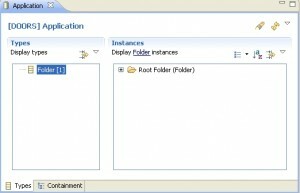 A Folder is made of Modules, that can be Formal (FormalModule) or Link (LinkModule). 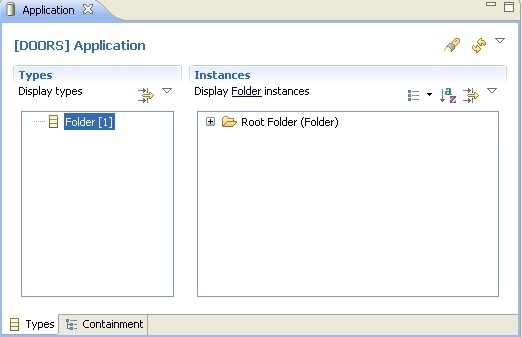 A FormalModule has Objects, and Objects can contain other Objects (nestedObjects). 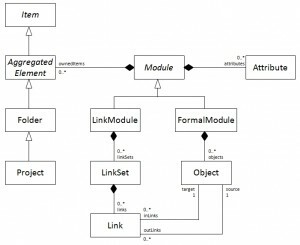 A LinkModule can have LinkSets, themselves containing Links between Objects. 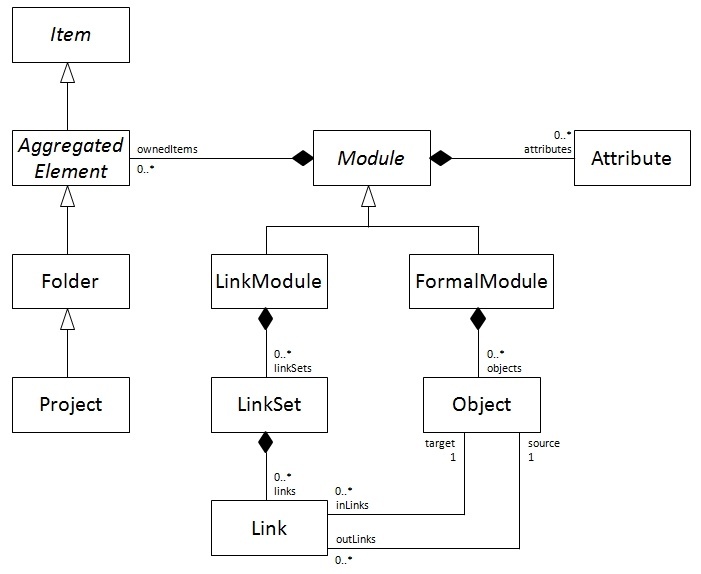 A LinkSet is represented by a source FormalModule and a target FormalModule. 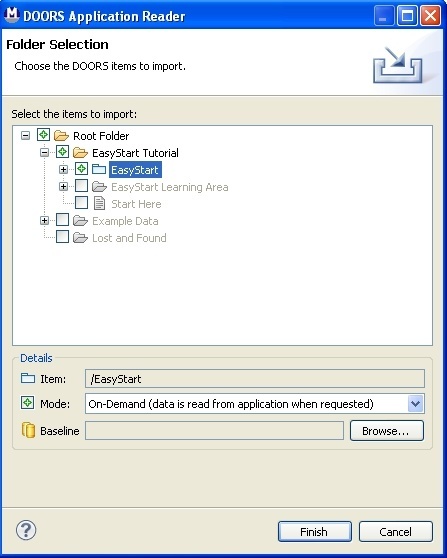 To read from a DOORS database, the DOORS client application must be open. Our example, the EasyStart training data base, is provided by IBM. 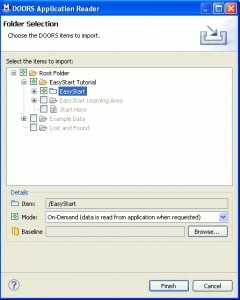 Using the Application reader, open the DOORS Database in MDWorkbench. Note: To learn how to open a Model in MDWorkbench, refer to the Introduction to MDAccess for Excel article. Into this mode, data is read from application when requested. A click on the plus sign of a relation calls the appropriate DOORS API. Indeed, the main reason to use the On Demand mode is the size of databases. When they are too large, it is a means to load only the interesting part and not the entire database. In this mode, data is never read. Into this mode, all selected elements are read at once. This is an interesting mode when all the information from a particular node in the DOORS database is needed. 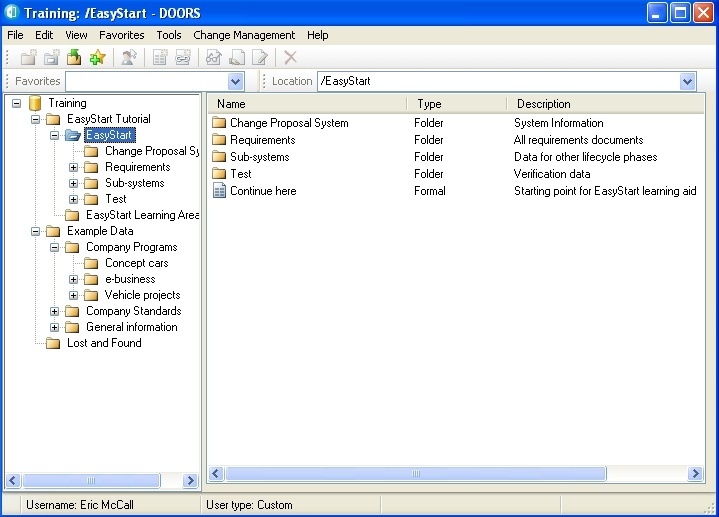 We choose to import the EasyStart project using the "On-Demand" mode. Note: It is also possible to import a particular Baseline. The DOORS model is opened in the MDWorkbench Model Editor. Only one Folder is loaded, the Root Folder. To load the other elements, click on the "ownedItems" reference. The "EasyStart Tutorial" Folder is loaded. Use the "Application" reader to populate the Model. Note: For more information on how to use reader options, please refer to the MDAccess documentation. Now, execute the code, running a Runtime configuration. Note: To know how to launch a Runtime Configuration in MDWorkbench, and notably to set the license location, refer to the Introduction to MDAccess for Excel article. First, we need to reduce the scope of reading to the "Design" Folder. This time we are doing a complete import because all the elements from the "Design" Folder are needed. + " - Module Target = "
This article shows you how to easily read DOORS Database using MDAccess for DOORS. Using the On-Demand connector, the execution is faster because just the needed/necessary elements are read.